[Saleh] said when he was speaking to [his mother], a woman in the seat in front of him turned around and told him he ought to speak English. Saleh said he told her he can speak whatever language he likes, and her husband responded by standing up and screaming at him. Then about 20 people allegedly said they were uncomfortable with Saleh and his Arabic-speaking companion. 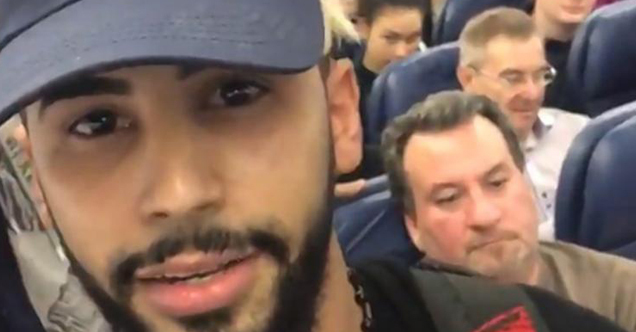 The pair were approached by the captain, who Saleh said “seemed ashamed and embarrassed” when he asked them to leave the plane because of the other passengers’ complaints. It should be noted that Saleh had his flight rebooked with Virgin, not Delta. In October 2014, Saleh created an hoax video of him and a friend being harassed by police after publicly arguing in traditional Muslim garb — the video went viral despite being staged. Nonetheless, Saleh’s Delta story remains disturbing amid President Donald Trump’s campaign promises to instate a national registry and ideological loyalty test for Muslims; the U.S. has actually had a similar national registry in the past following the September 11 attacks in 2001 — both ideas are unambiguously racist and encourage violence against Muslims. In October of this year, Southwest Airlines kicked off a passenger for speaking Arabic as well.